Researchers from Finland and Taiwan have made a discovery on how graphene, a single-atom-thin layer of carbon, can be forged into three-dimensional objects with the help of laser light. A prominent illustration was provided when the Researchers fabricated a pyramid with a height of 60 nm, which is almost 200 times bigger than the thickness of a graphene sheet. The pyramid was so small that it would effortlessly fit on a single strand of hair. The Academy of Finland and the Ministry of Science and Technology of the Republic of China supported the research. Graphene, a close relative to graphite, comprises of millions of layers of graphene and can be spotted in common pencil tips. After graphene was initially isolated in 2004, Researchers have learned to regularly produce and handle it. It is possible to use graphene for making optoelectronic and electronic devices, such as photodetectors, sensors and transistors. In future, there is the possibility of seeing an increasing number of products comprising of graphene. We call this technique optical forging, since the process resembles forging metals into 3D shapes with a hammer. In our case, a laser beam is the hammer that forges graphene into 3D shapes. The beauty of the technique is that it's fast and easy to use; it doesn't require any additional chemicals or processing. Despite the simplicity of the technique, we were very surprised initially when we observed that the laser beam induced such substantial changes on graphene. It took a while to understand what was happening. "At first, we were flabbergasted. The experimental data simply made no sense," says Dr Pekka Koskinen, who was responsible for the theory. "But gradually, by close interplay between experiments and computer simulations, the actuality of 3D shapes and their formation mechanism started to become clear." "When we first examined the irradiated graphene, we were expecting to find traces of chemical species incorporated into the graphene, but we couldn't find any. After some more careful inspections, we concluded that it must be purely structural defects, rather than chemical doping, that are responsible for such dramatic changes on graphene," explains Associate Professor Wei Yen Woon from Taiwan, who headed the experimental group that performed X-ray photoelectron spectroscopy at the synchrotron facility. The novel 3D graphene is considered to be stable and it has optical and electronic properties that vary from normal 2D graphene. 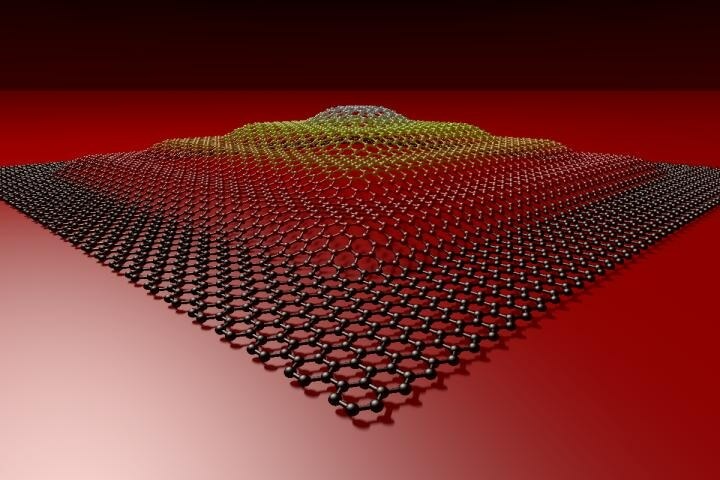 Optically forged graphene can assist in fabricating 3D architectures for graphene-based devices.